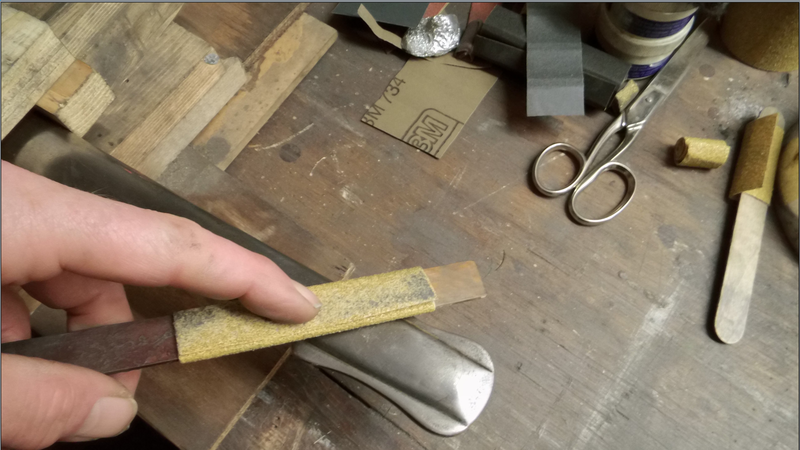 Antique Blades: Cleaning and Polishing the Ulahn Way. Requests were made to say something about my method of getting that nice shine on many an old and pitted blade and scabbard. It is for you to decide what you want to take from this post, how far you want to go with this cleaning business, to find out what you can and cannot do. Most people lack motor skills or did not have the opportunity I had to develop them and I cannot see from here which is which. I just tried to write down a method, a process which looks rather simple to me. As I have worked with my hands my whole life, this kind of work comes easy. Even so, it took me some time to work out the regimen I will try to explain to you here. It works for me. You may disagree. I do not state the above to present myself as some Lord of Magic Fingers, but to, first, make you aware of your limits and secondly, to try to prevent the unfortunate demise of half finished antique blades, shoved back into half worked scabbards to remain there until ,,later, when I feel like it'', which, as we all know very well, most probably is ,, never ''. Therefore I would like to suggest you start with the 3M brown mat or valve cleaning compound and work your way down the grids until you find a grade of polish that you are satisfied with. Giving an old tired and grey blade a nice sheen is not very difficult and also, a nice sheen will cover up many nasties. If you start with 80 or even 60 you better damn well know what you are doing. Expect to work standing slightly bend over for 1- 3 hours a day for two to three weeks at least, with oily black hands and blowing black snot like a zombie. I cannot recommend working more than 3 hours in one go. It is not only your body that will be going to protest, but your mind too and you will have to be fully alert. After some time you may find that your mind wants to wander or shut down dreaming and then accidents will happen. Since I have a day job too, one sabre per three weeks is just about fine with me. The Ulahn way does not involve machines. Not even a Dremel. Never. Machines run too fast even at lowest speed and are not easy to control. And control is needed to prevent an old blade looking like it melted like many Windlasses do and to not take off way too much material. Also, you run the risk of burning a blade really easy, specially on the thin tip section. Dremels do this in no time at all. Best to go easy on these geriatrics. Restoring the sharp lines is a very important factor of doing this job in a successful way. Also, doing this work by hand forces you to keep your nose to the blade and thus you will see what is going on, the effects of what you are doing, which may be quite surprising. Seeing the old tool marks, the story, you'll get to know the blade a bit. A first: Get good light. This does not mean to have an enormous wattage, but more the way you direct the light. Nothing is so irritating and quite harmful as being blinded by reflexions all the time. Therefore, bouncing the light from the ceiling and / or a wall might be a good solution. Experiment with this until you find the ideal set up. My bench is 90cm high. This is the standard for regular work. To work on the blades I gobbled together some left over pieces of wood to make a stable kind of shelf on top of the bench that I can place anywhere I want. Here I can clamp the blade flat and have the hilt sticking out free so it does not bother me. When I work on a ricasso I clamp the blade at the tip or in the middle with a piece of wood between clamp and blade and when I work on the tip or anywhere else I can clamp the blade at the ricasso. 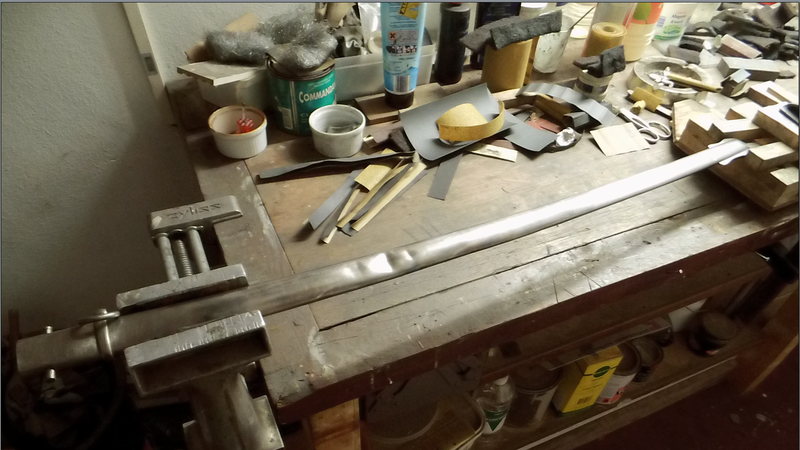 It is very important to be able to clamp the sabre in any position so that you can work the blade how you want it. 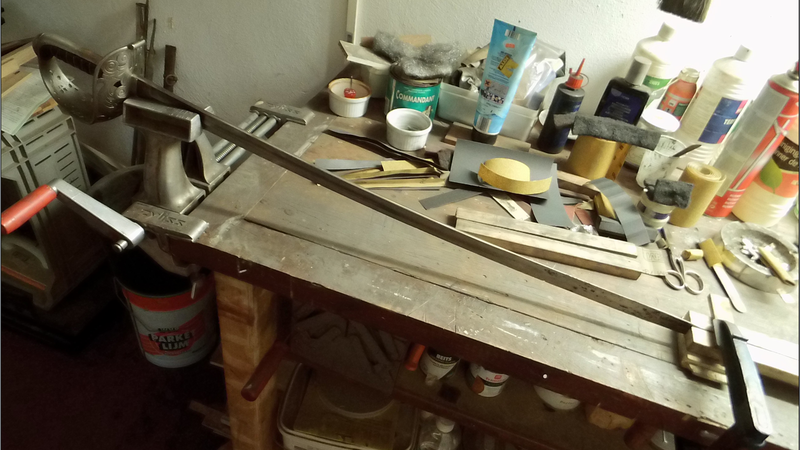 Now, with the shelf in place, the work surface is all in all about 120 cm high and I will not break my back. And nothing is so exhausting as to have to control the blade with one hand and to work with the other. All your attention should be focused on your work, not on preventing the blade from slipping and landing on your feet. There will be quite a lot of black dust. Most will be dust from the sand paper, however, it will go anywhere you don't want it to go. So you need some space free of pets, kids and spouses where you do not have to worry about leaving the blade in situ when you are done for the day. 3M yellow 60 and 80 grid on a roll. Paper sheets 120, 180, 240, 400, 600. Optional: Valve cleaning/grinding compound coarse and fine. I found this stuff, mixed with a few drops of oil, to work wonders. I use coarse after the 240 and go over it with 400 again. Than buff with fine and go to the red mat and up. It may not save much time, but you get better results. A small blob will go a long way. I use a piece of old cloth to work with it. 3M red brown and grey mat. Coarse, middle and fine steel wool 0000 grade. Light machine oil. I use the oil made for sewing machines. Cheap and very clean stuff. And lots of old clean rags or tissue paper. I always have some rolls of toilet paper at hand. Which brings us to the trash. There will be quite a lot of that, so get something you can use as a trash bin. 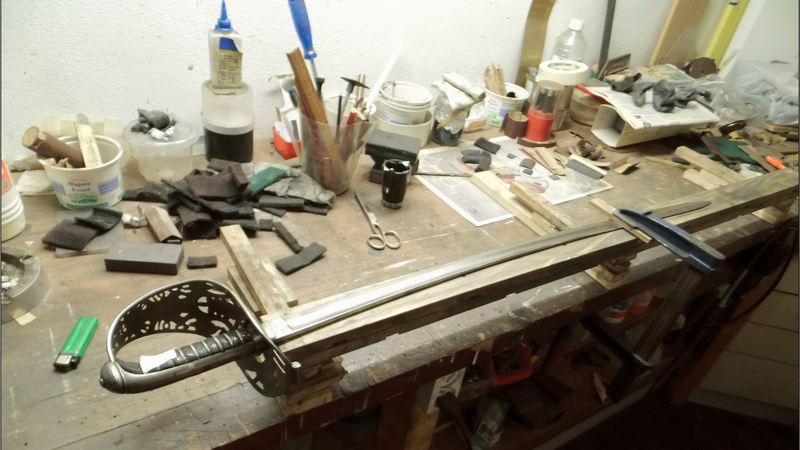 Nothing has a more negative influence on your work as having to wade through discarded sand paper or oily bits of cloth on the bench or the floor every time you want to start the next round. Cut a strip about 1" wide and about 20 cm long from 80 or 60 grid and roll it tight on something. I use the handle of a locksmith file. The purpose is to make a small roll without the thick paper cracking. Cracked paper makes a hard ridge that will cut into the steel like a chisel. We do not want that. Take the stiff roll of the handle and let it loosen up a bit. Now it will form itself to any surface you want to sand, whether a wide fuller with a round bottom or a flat part of the blade. A slender roll will fit into a narrow fuller like the top one on the French M1822. At this stage I do not use oil. I need to see what is going on. Sand in portions of 5 cm up and 5 cm down over the length, so you cover an area of about 10 cm. This is done to have overlapping sections. If you need to stay in one spot for longer, always smooth out that spot. You do not want new dents. View the blade from different angles, so you see what is happening. What looks okay in one position, might look awful in the other. Rule: Always start at the lowest place, so always start in the fuller if there is one. Work your way up to the end of the fuller and be very careful here. The fuller bottom will come up to the ridge at the start of the tip section and the paper will want to cut deep. Better leave the end be for a higher grid as low grid scratches are very difficult to remove without destroying the fuller end where the tip section starts. This ,, end of fuller '' ridge should be crisp or at least emulate the original. Do not make it worse than it already might be. Troopers had to use fine sand to clean their blades, so it is a wonder anyhow that there is anything left for us to study and pay mucho $$ for. 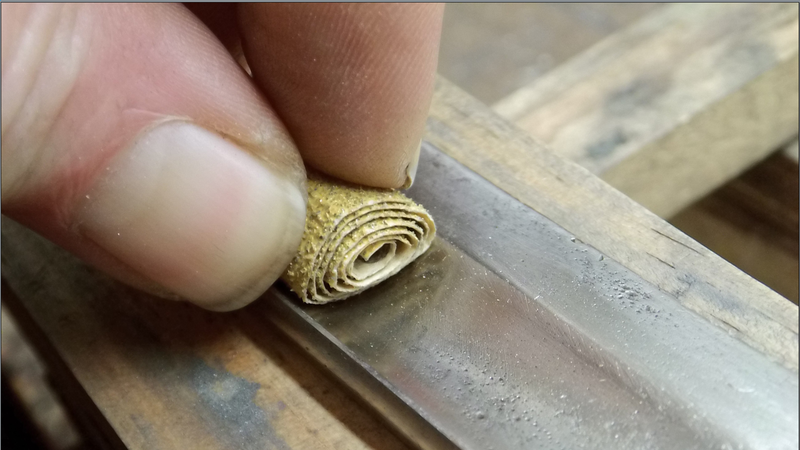 One of the nice things of this roll business is that, when held by the end and again rolled up tight, you can stick it just under the ricasso at the start of the fuller where often a lot of rust resides and also in this way you can go around any stamps that may come into your way. You can work such a little roll, of any grid, just like a pencil. When a piece of the roll is done, just tear it off. About half way in the use of the roll I rewind it so the last used part is inside and I now can use the rest and still have something to hold on to. See whether there is a ridge going from the fuller to the tip. This ridge may be faded over time. Turn the blade in good light. This can work wonders and may reveal the most washed out features on a blade. Take a felt pen and mark the spot where the ridge meets the fuller. Mark at the tip end too. Draw the line with the felt pen and a piece of straight card board. Get some wide painters tape and tape about 1 mm OVER the line. Sand. I use the method mentioned in the Cutting Edge section, with four fingers under the blade and a piece of sand paper under the thumb, but, like in the picture above, where there is lots of deep rust, I will use the roll. The roll just cuts deeper. I will still have fingers under the blade though, just for direction. Remove the tape and do the other side again taping 1 mm over the line. When the tip section is clean, tape ON the line and polish. Now do the other half and again tape on the line. If you do this with all grids up to 400 you'll have a nice high and straight line going from the fuller to the tip. For the section where the tip part goes above the fuller to where the foible starts and to straighten out the ridge of the fuller - tip section divide, I fold a piece of 240 or 400 grid over a little wood block and sand. This creates a nice sharp edge at the fullers end. Clean the blade and oil it a bit. Clamp the blade with the edge facing away from you. Lay the paper of choice, a piece as large as the tip of your thumb, on the edge. moisten the thumb, place it on the piece of paper and fold your fingers UNDER the blade. This helps greatly in controlling the work. Also now you can adjust the pressure. Be careful to not cross the line to the fuller but get as close to it as you can. Another reason to have the edge facing away from you: You will see the fuller - edge divide much better. 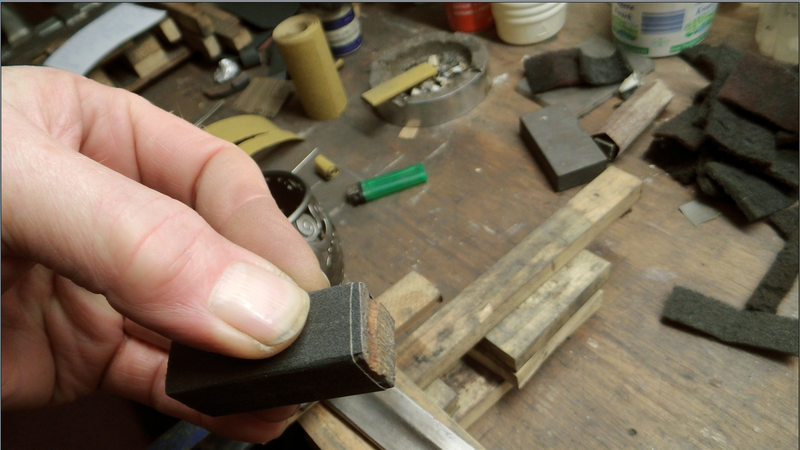 Later I will use the little wood block to work up the edge - fuller divide line. I do this when I reach 400 grid. What grids come after do not interfere too much with crispness. Those are just for polish and hardly take off any steel. Depending on what you like, you can start with a little roll from 180 grid or use a small piece of 180 paper as big or small as you index finger top. That is what I do. Clean the blade and oil it lightly. Cut a 1" wide strip. Tear off a small piece of paper and lay it on the blade. Moisten the tip of the index finger, place this on the paper and place your middle finger on top of said index finger. Now you can add pressure without feeling like you are under torture after a while. This may sound rather nutty, but believe me, it works wonders for your well being when you polish for a couple of hours. Besides, in this way you can direct the paper 100% to where you need it to go. As I said before, control is all. This method also helps you to use your left hand. If you can switch hands and believe me, it is very easy, you work much longer and without much discomfort. 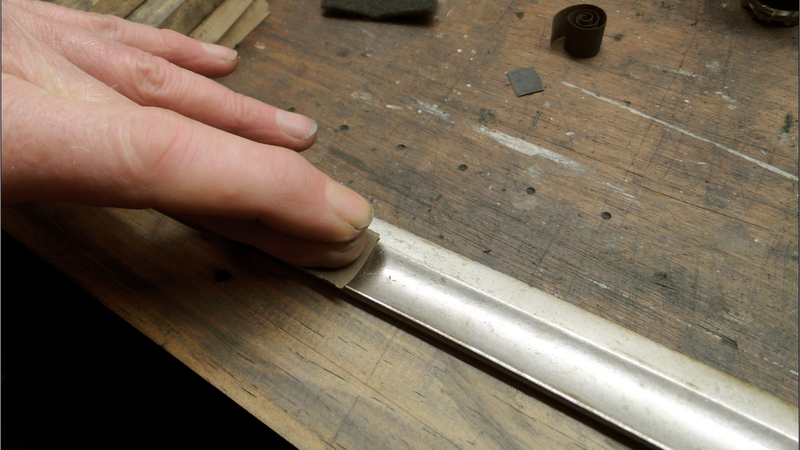 As the ridge formed at the end of the fuller, where it goes over into the tip section, is very important to keep intact and if faded out to restore, this way of polishing makes it possible to finely adjust pressure and prevent the paper from digging in. Here, at this spot of the blade, less pressure is required as down in the fuller. Polish this way for a couple of sabres and you can crack walnuts. I always do 60 - 80 on both sides and do a full polish on one side only. This done, I clean that polished side with acetone and tape it off with the paper tape. Now I do not have to deal with scratches in my new polish when I do the other side, as hard grid gets under the blade to ruin previous work however much you clean up. Tape the blade and be done. Note: Repeated licking of your finger tip during the process will turn your front teeth a nice ,, Old Hobo Black ''. You will taste the steel also. All part of the plan. 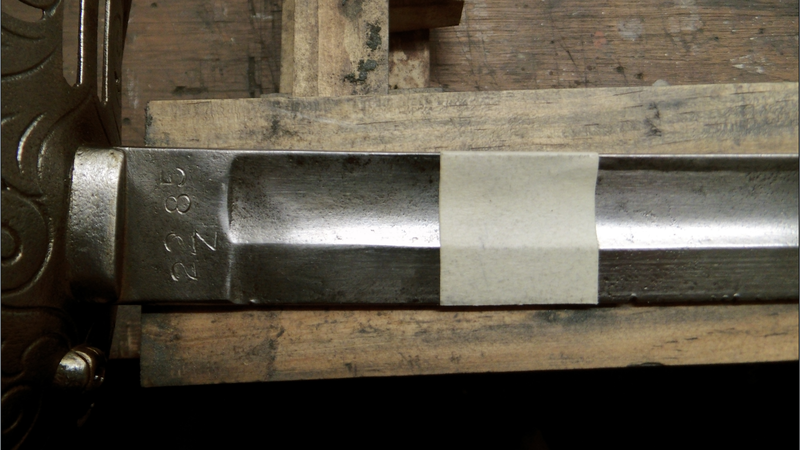 When there are stamps on the ricasso you must not sand here, or at least only use 400 grid and up, with oil. Try the sanding pencil thing and be careful. Coarse or fine valve cleaning compound works too. Just do not go too far. What also works is using aluminium foil rolled up into a stick and some oil, although to a lesser extent than say valve cleaning compound. This is the place where a lot of rust and goo may be found. The virtual rust bucket. I use a thin flat popsicle stick to get between the langet and the blade. Fold some coarse paper round the stick and use it like a file. Lots of crud may come out, so change the paper rapidly. Shine some light in there to see what is going on. I use a key fob with a little led light in it. If there is a leather washer left, try not to damage it. If what is left of the washer is not worth saving, get the lose stuff out. If remnants are under the blade shoulders, let them be however. Cut a new washer when the sabre is done. 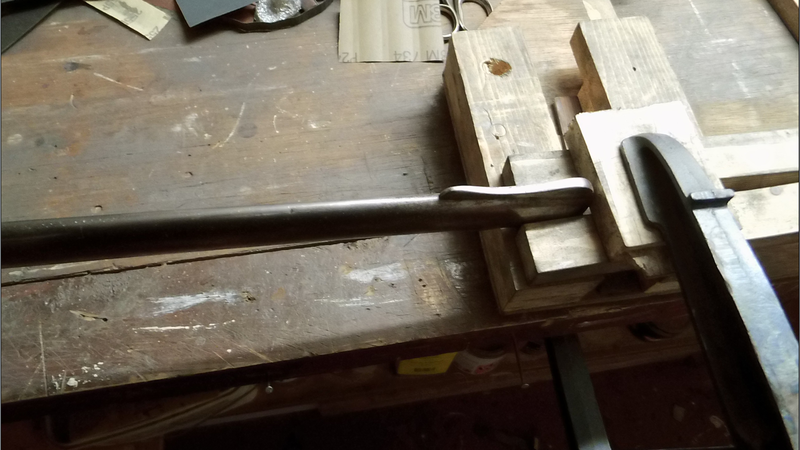 I place the blade in a vice with the tip resting on a block, so with a bit of fiddling I can clamp down the tip too. Be very careful here also. French blades are marked on the spine and the etch may not be too deep as it is, or faded from frequent cleaning. I would like to suggest the pencil method by slowly sanding with 400 or 600 grid and oil around the text, or just going over the text with the red or grey mat and oil. The rest of the spine can be done with the little sanding block wrapped with a grid as required. Only use one layer of paper as you do not want it to bulge over the edge too much. The sanding block will tell you when you are sanding too much on one side. 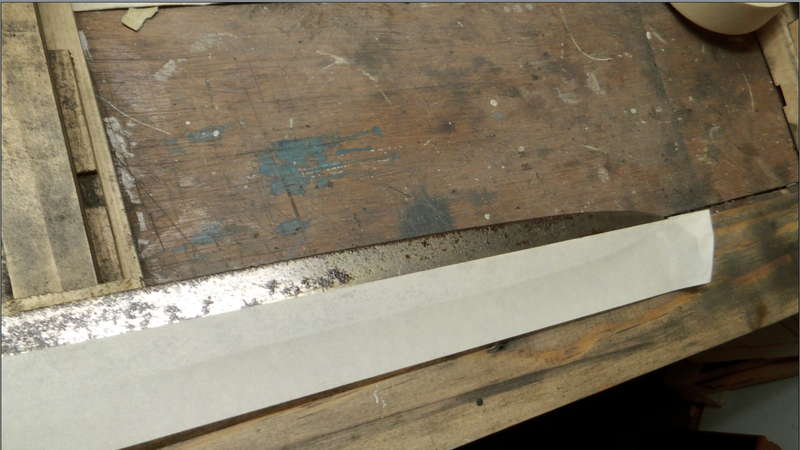 Note that just under the spine often there is just a very narrow ridge when the blade is viewed from the side. This means that in order to keep this ridge intact you do not have much room to work in. Dents on the spine show up here, so, as always, be very alert. When the spine is clean you can of course polish as you see fit, but do not touch the text too much. Better have that section fade into the brighter rest of the spine. As long as rust and crud are removed it should be okay. Before any sanding is done, an inspection under good light will tell you if there was a counter polished section at all, or how long it was. 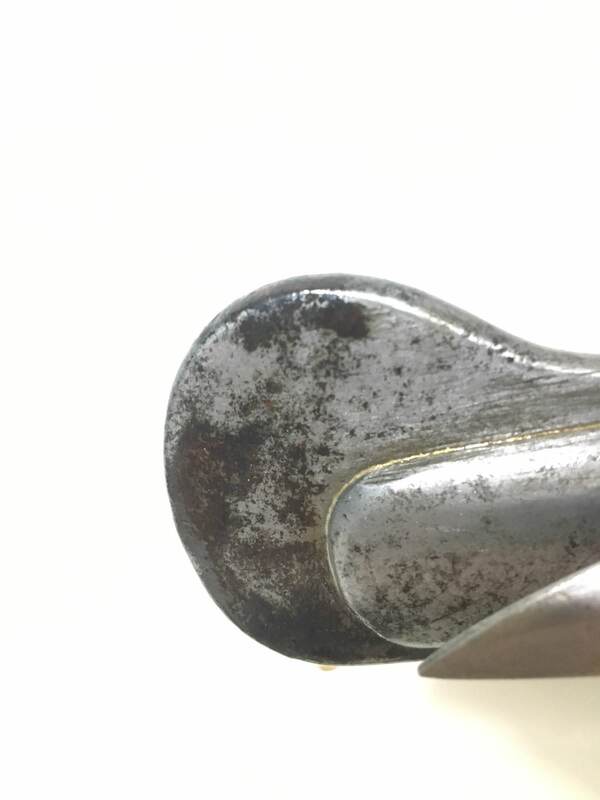 Scratches going the width of the blade are evident at the start of the fuller on all sabres. Those deep scratches are machine marks and the counter polish they did was to make them less obvious. During the blades life the counter polish could have been removed by repeated cleaning, but with a bit of luck you should still be able to see where it ended. On most blades the old counter polish ends about 2" from the ricasso. After all the work on the blade is done, this section will have been cleaned up and most scratches will be gone. So BEFORE you start working on the blade, measure how long your counter polish section is if there is any and make a note. Say you have a counter polish of 2" from the ricasso. This is going to be tricky but bear with me. First clean the blade with acetone. You need a line across the blade here parallel with the guard. Mark this line with a felt pen and a piece of carton or paper and tape the line off at the blade side with the painters tape. Make sure the tape is parallel with the guard. Turn the blade around and tape a piece over that side to where you see the other tape stick out. Tape another piece of tape over the first so you get a thick paper wall. Fold a piece of 400 grid so you have a straight edged piece of 1" wide and 3" long. Place it on the blade next to the tape, moisten your finger or thumb and start slowly and carefully going over the width of the blade as close to the tape as you can get. Be very careful. Once this is done the rest of the counter polish is easy. Take care the new fine lines are going straight up and down and do not forget the ricasso. Not much sanding is needed. Just going up and down a few times is enough. The polish will show up directly. Remove tape and your done. In most cases the spine was not counter polished, but if it was you now know how to handle that too. 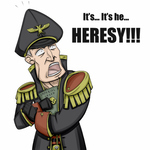 It is important to have the scabbard free from the bench. 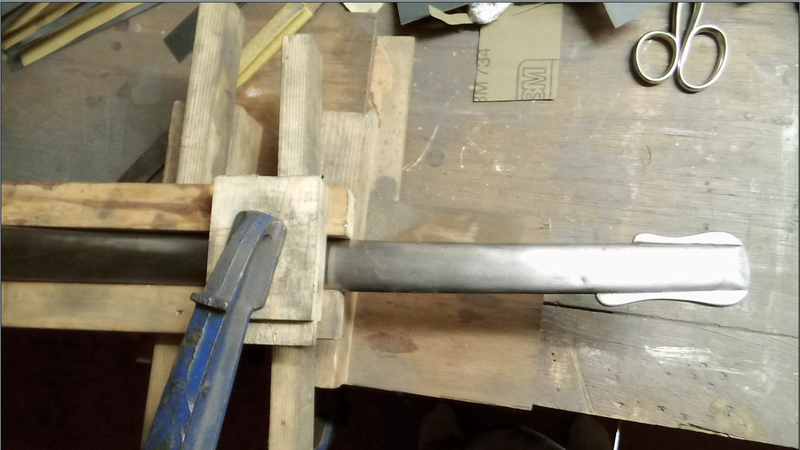 This works best and as many scabbards have a good bend it is important that you find a way to have it as close to you as is possible whatever side you work on. My vice is a clamp on with changeable clamps. This is very handy to have, as it accommodates even the most curved sacabbards. The brand is Zyliss from Switserland. I do not know whether they have them anymore. This one is more than 40 years old. Anyway, it works very well. Observe in the pictures how the clamp position changes. And just as with the blade: you need two hands. The scabbard needs to be clamped down tight at the mouth and the drag. The scabbard has 4 sides, so you will have to be able to secure the scabbard in all positions you need it to be. For the raw work I take a wood stick formerly used as a paint mixing stick of about 20 cm long. I'll bet Home Depot has them in all sizes. It is now possible to hold the stick like a file and use it as such to eradicate most pitting and rust. I use both hands here. The right on the underside with the thumb on the paper to prevent it from slipping and the left holding the top end to steer. Be careful again here. 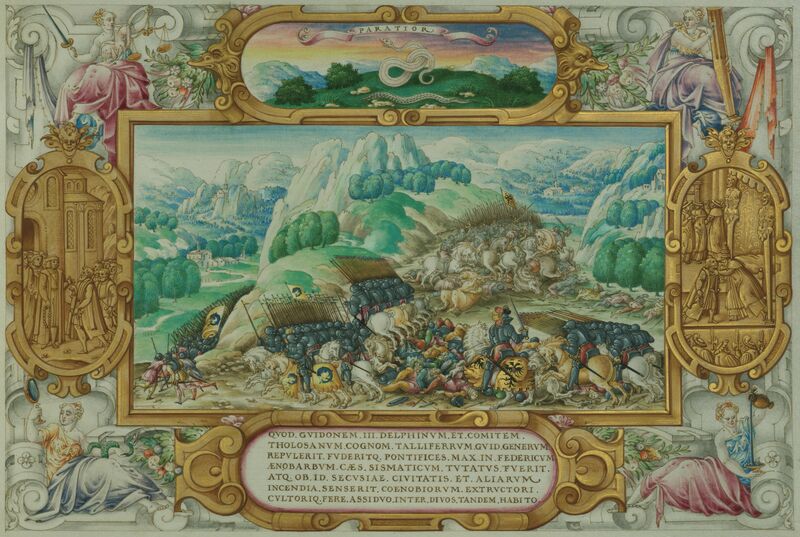 The scabbard wall is only 1.5 mm thick AT MOST, so in an overly enthousiastic hunt for pits do not sand right through. Not that this will be easy to accomplish, 1.5 mm thick steel is a lot to sand through, but I am just saying. Always work over the width and always follow the curve! If, before you start, you have examined the scabbard, you may have found that under all the debris of ages there are spots where you can see the old finish. The old finish always has faint scratches going over the width, at least with French scabbards this is so. These scratches are the remnants of the old 5 stage polishing process. They started going over the width, then switched going over the length and so on until at last going over the width again. This was all specialist work done with big wheels. We have to only remove pitting and rust from the last stage. Once you get the hang of it, this part of proceedings can go quite fast. Do not forget the ring mounts. You do not want to have to come back to the ring mounts after you have polished the body. Note: I tried going over the length once, after going over the width and it turned out awful. Do not try it. It takes like forever to get the scratches out again. 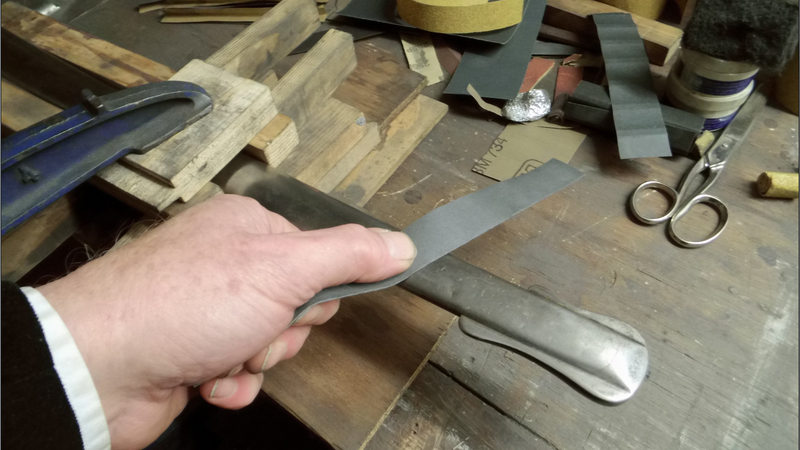 For the polish I make a strip of 2" wide and fold that in two over a ruler, so I have a strong straight edged strip 1" wide. If the edge is not straight it will tear. The round scabbard body will do that. Now hold the upper end of the strip with your left and the other end with your right hand. 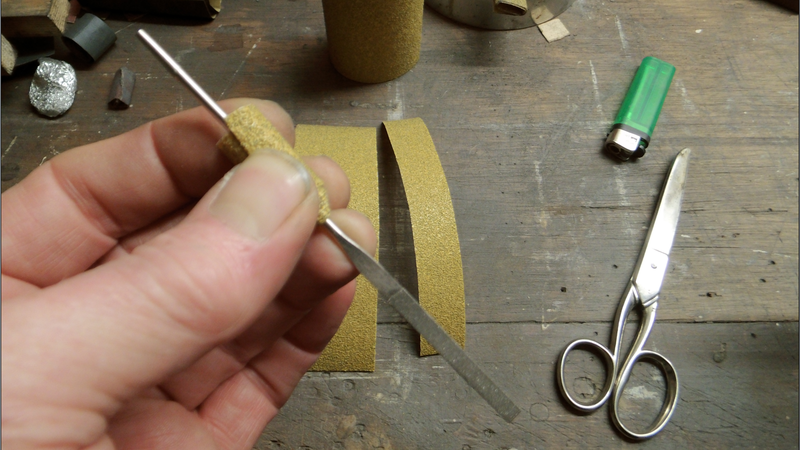 Set the strip over the scabbard and use the thumb of your right hand to add some pressure. I had to use my left hand here only, in order to make the picture. Soon you will have the hang of this and polishing this way will go fast. If you do not pull too hard the strip will last quite long. Just start with a short piece sticking out on top for the left hand. Sand. If the paper gets dull, just shift the paper up so you have fresh paper under your thumb. Work your way down the scabbard and again: Do not forget the ring mounts. There will always be some faint scratching remaining. That is no big deal as the original polish was not any better as far as I can see. The mouth and the drag. You will have to place the scabbard in the vice in between the two rings and the clamp somewhere in the middle. Anyway so that you can work on the mouth and the drag too, without being bothered. The mouth is not so much of a problem. Just follow all of the above. The drag may be a problem though. Very often this is the most problematic area. Lay the scabbard so that the drag is close and the flats are easily reachable, with the longer side of the drag facing away. Use the paint mixer stick and some 60 - 80, fold it over a couple of times and lay it flat on the drag right against the scabbard and on the longest drag end. Start sanding but hold the stick as flat as you can. The point is to NOT sand down the sharp edges. Keep those edges intact as much as possible. 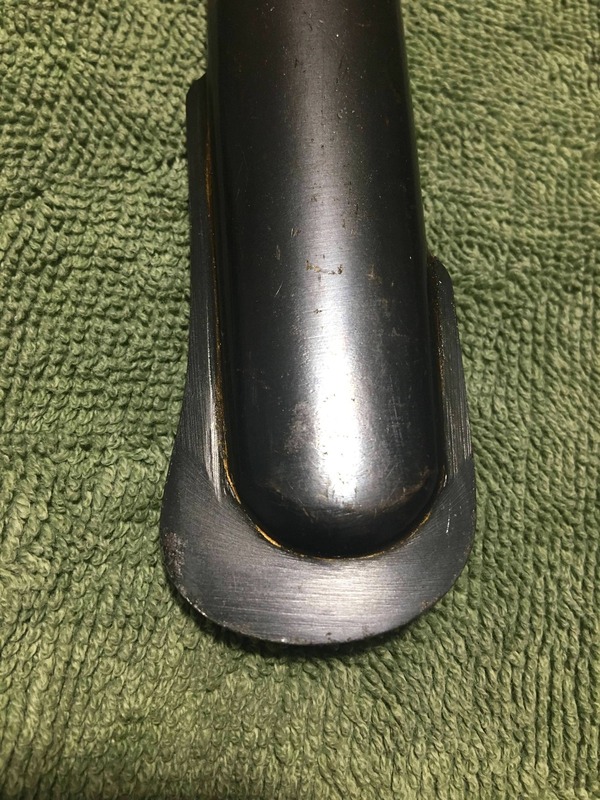 The point is also to have the sand paper cut into the scabbard wall so the rust bucket area between drag and scabbard, where the drag is brazed to the scabbard, is cleaned up. Work all around the scabbard and drag and never mind the scratches. 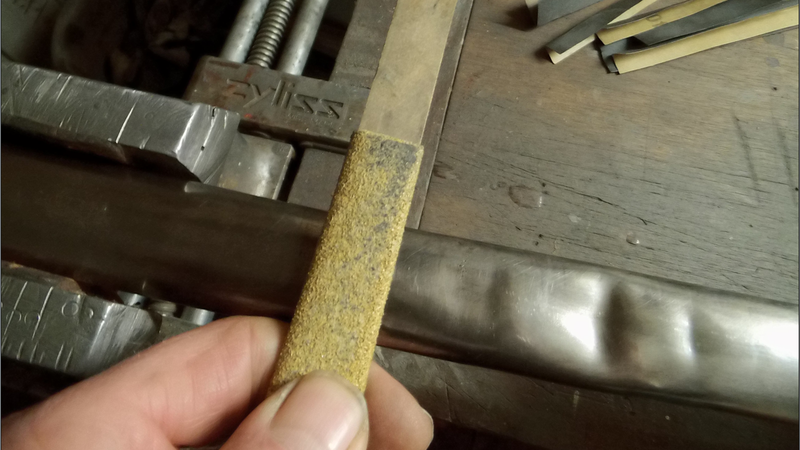 The drag will have lots of left over scars from the factory and use anyway and if viewed from the side, the scabbard at this point will display lengthwise scratches left over from the fact that the original polisher did not get in there going over the width. Nobody cared anyway. Do the above in all grids and you will see the scratches getting fainter and fainter until almost nothing remains. It may even look better now than it ever did. 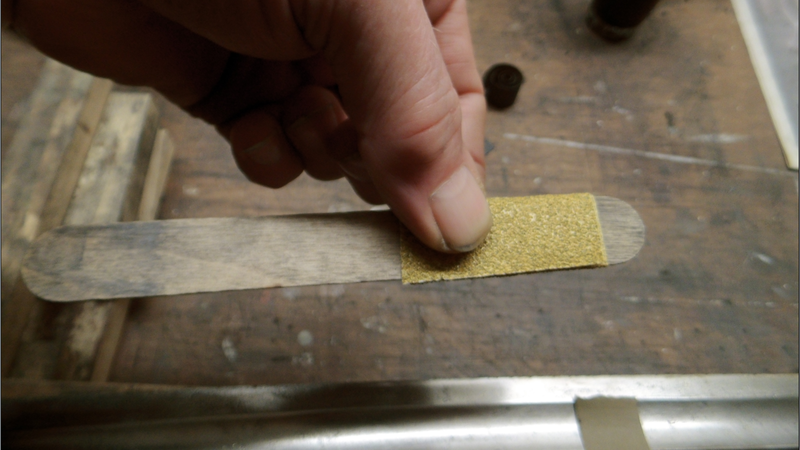 For sanding and polishing this last bit of the scabbard just follow the above procedure. There will always be some pitting or dents or whatever nasties remaining. That should not be a bummer. Also, do not try to remove smallish dents. Around the edge of a dent the material is very stretched to accommodate the denting in the first place. Better leave them be and just clean the bottom. I hope this guide will help you in some way. This is how Ulahn does it. Feel free to experiment just as he did and find better ways. I may have forgotten some stuff. If you have any questions, just ask. Anyway, use your common sense whatever you do. Study the sabre a bit before you begin. Make notes. Take pictures as reference. Be careful, but do not be afraid. You can do this too. No problem. In various threads I have touched upon this polishing business. Thanks for sharing. That's a saver and bookmarked. Thanks again. Awesome, bookmarked and saved. This should be pinned imo. Really useful info. Really nice post. I hesitate to ask this question but have you ever had anything re-plated? 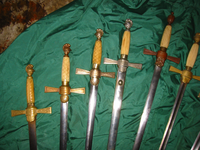 I'm asking that about the hilts, since more recent (since, say, 1890) swords had plated parts. Had my French Superior Officers and Prussian IOD 89 hilts gold plated. 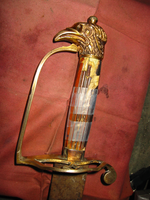 French Officers hilts were all mercury gilded. That process is very old. Way back in the BC. I think you mean nickel plate? That started on industrial scale about 1870. This gentleman has three videos. The results are spectacular I might say. His mix really works. With his stuff you can plate anything over anything. New nickel plate does look much cheaper than the old. Much harder. Rather nasty I think. Wow, you finally wrote it all up! I hope to get one of my sabres done this way by the end of the month. Thanks very much Uhlan. I've heard of gilding but I don't really understand it. I've never heard of mercury gilding, though. But as far as plating goes, I meant plating with anything that was used historically. Some things are chromed-plated now that were probably usually nickel-plated in the past. And of course, some things were blued, at least the blades were. If you have ever had a silver or gold filling from a dentist, that is a similar mix/amalgam of mercury and precious metals (the dentist is squishing the mercury out). Applied to a surface or etching after priming with copper, then the mercury boiled off leaving the gold adhered to the metal. Sometimes regarded as fire gilding. The fabulous blue&gilt blade decorations are done in that fashion. The method continues by some jewelers but with much better safety precautions taken compared to the work of earlier centuries. Rolled gold plate rgp is a plating where thin sheets of precious metals are bonded to the object with heat and burnishing. Sometimes labeled as gold filled. A blue&gilt blade of the mercury or fire gilding. The nitre salts recipe lending the blue (rather than fire bluing). In this example, both b&g with bright etched panels. Both techniques anything but new age except a trend. Blue on sword blades is not plating and has nothing to do with nitre blue. Nitre or salt blue was and still is mainly used to blue gun barrels and other fixtures on guns. Nitre blue does not affect the surface of the steel itself but deposites salt crystals on the steel that toghether with the agitated steel molecules bond and form an extreemly hard layer on top of the steel surface at temperatures exeeding 1250 degrees. I forgot Celcius or Fahrenheit. It is very bloody hot anyway. With sabre blades the blade was cleaned and evenly heated up. Beginning at 175 C the metal surface changes colour. During the heating process you will see the whole range. It changes to the famous Peacock blue at about 325 - 350 C. A gold deposit on the blade will melt at this temperature too. Since the process is in low heat spectrum, the tempering will not be affected. When the right blue colour is reached you have to dunk the object in an oil bath. Wait 2 seconds and the colour will have changed, so speed is of the essence. After a soak of 1 to 2 days in the oil, the blades were re - polished and the unwanted blue removed. Hence the straight line where the blue stops. Eventually they could do better with the blue removal process and as a result could produce blued sections with a kind of plant like tendrils going over the freshly re - polished steel. This kind of blue forms only a very thin and weak layer and is strictly for show. Rust will go right through. Overheating will result in a drab grey colour and after that the metal will start to glow cherry red. You can do this in the kitchen with a small object, like a large polished iron nail, or a cleaned surplus kitchen knife, preferbly with a wood handle. Plastic will melt and burn. Heat plating is bonding of for instance an iron object with a very thin gold sheet. This is, like fire gild or mercury gild, a very old process. When enough heat is applied to the iron, the gold sheet will melt and its molecules will fuse with the heated iron molecules. This method is much safer than mercury gilding. There are no mercury fumes that, once inhaled, attack the nervous system and in the long run will make you go crazy. Also your bones will deform. The story is that the actual mercury gilding was mainly done by street urchins and other ,, undesirables ''. They had horrible and short lives. Since about 1870 we use electro plating. Mercury gilding is strictly prohibited in the West at least after about 1910 I think. Today a good jeweller can play around with the voltage and get an effect that looks much like the old fire gilding. I paid about $60 for a hilt. Gild plate and silver plate had dual functions. It was a symbol of status, thus the gilded Officers sabres for instance, but it made maintenance much easier too. 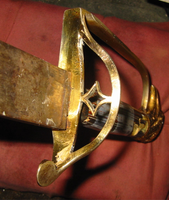 Before 1870 lots of sheet metal scabbards were silver plated. Those did not rust anymore but tarnished the uniform. Silver oxyde is a deep black. There are still old silver plated scabbards around. People sometimes mistake them for nickel plated scabbards. The sheen of silver, especially this old silver, is much softer than old nickel. Harder looking still is new nickel plate. 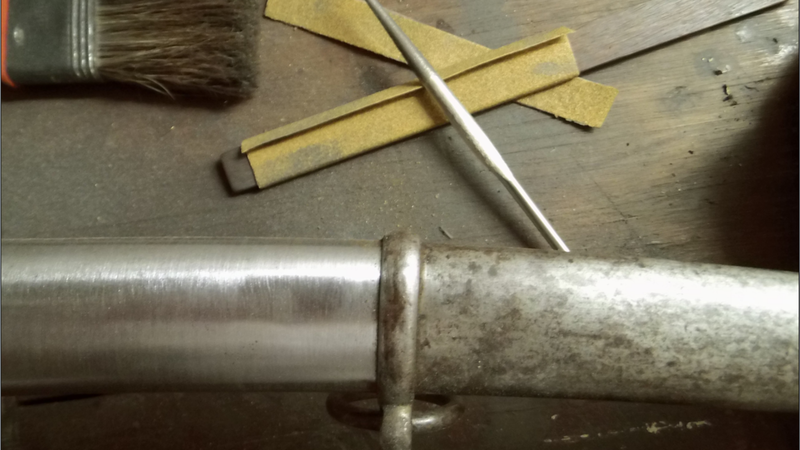 As nickel does not tarnish as much and as easy as silver and protects the underlaying steel even better, it is much harder than silver, many a scabbard was nickel plated after 1870. Chrome came much later on the marked. I think it was around the 1930's, just in time for WWII. There are many blueing processes. Nitre or salt blue, charcoal blue, rust blue where the rust is boiled off to reveal the blue layer underneath and heat blue. Nitre blue is the hardest but the process is very tricky and can be dangerous. It produces the best results though. Youtube is a good source for info. Chemical blue like Birchwood etc. is not blueing at all. It is mainly acid blacking and not very tough. It is very cheap though and can be done by anyone. I passed on a beautiful French sabre from the 18th century with a lovely heat blued iridescence. A good many 17th century smallswords as well show this very translucent bluing. Nitre b&g often gets to be really sloppy compared to the finer examples that get more cleanly polished out. The graveyards of Birmingham England have been examined for mercury content. 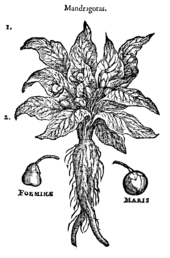 Mercury was also used to smooth felt, apparently first in France during the 17th century and migrating like so many things to England. Thus the term mad as a hatter. I had looked at mercury quite a bit this year and not surprisingly found a good many court cases up to the end of the 19th century re patients being dosed with mercury, a practice as old as the Greek Empire and likely predating that. One funny is a common repetition from one batch of artists of Birmingham is a little guy kind of thumbing the nose at any looking. A mecurial little happy dance of an eagle. I had also fooled around with a deposition of liquid suspended silver that can be worked into alloys. Not very durable though. The "Silver Secret" stuff is meant to touch up silver plate but I have done a couple of entire hilts. Found on old watch dials/faces, a finish often under glass. Mad as a hatter. Yes, good one. this works very well and produces a much thicker and more durable layer. At 3.5 volts it will start to burn and turn black.Now I use old silver scrap coins, like not mint Canadian Maples. 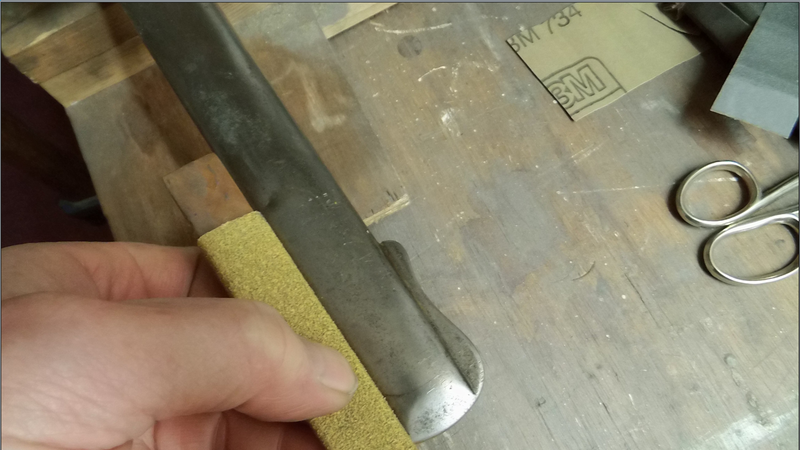 For anyone wanting to gild a hilt: There is ,, flash gilding '', a very thin layer which will not be very durable. This is very cheap. And there is ,, hard gilding '', where a nice good coat is layed down. This is done not to touch things up a bit, but to gild objects that are handled all the time. More expensive, but it lasts much longer. The videos above are for brush plating and brush plating can be done at home. It is fun to do too and quite safe. 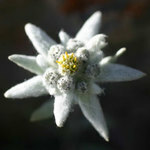 Edelweiss, that funny little guy looks like how Mandrake roots often were depicted. Also the lines of the gild are very neatly done on your example. Ofted one can observe, on Universal blue and gild blades, but on antique blades too, that the gild flowed outside the engraving, looking quite sloppy. Painting with a broad brush. It sounds like just about every kind of finish was applied to swords, although I suspect that the vast majority of blades were bare metal. Some firearm parts are still bare metal, though some may have been case hardened, which is a sort of a finish. Parkerizing has been used on blades but probably not sword blades. 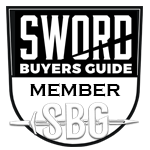 Anyway, I am relieved that a real sword connoisseur would have something replated. 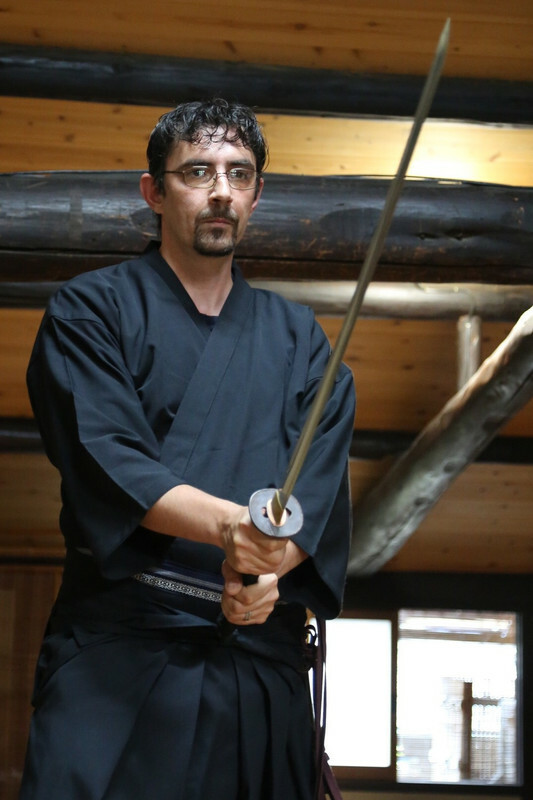 I do this with the 60 or 80 grid rolled over the stick, like I described in the scabbard section. 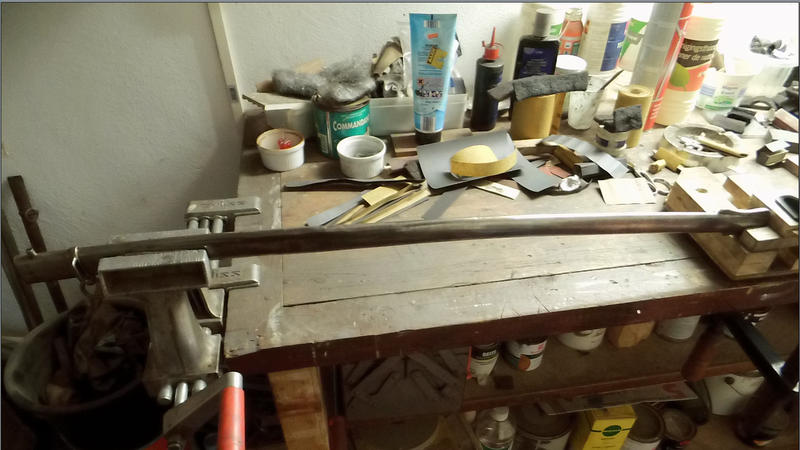 Looking at your picture, I would start at the top where the old file marks are and just keep on sanding following the profile of the scabbard end. It will look terrible at first, with new scratches all over each other, but do not worry. If you hold the sanding stick as flat as is possible, most of the black, if not all, can be removed and the thickness of the drag metal will not be effected too much. If you repeat this with higher grids, you will see that the new scratches will disappear. Another thing you will notice is that your drag may look awful right now, but that it looks worse than it is. So: start with say 80 on the stick. See what comes out. If you think that you will affect the thickness of the metal too much, leave what is left of the black be and go over the drag with a wire brush to remove the black that is left. There will be parts where the metal was eaten away, but at least those will be clean. Now go over the drag with 180 on the stick to remove the 80 and wire brush scratches and repeat with still higher grids until you are satisfied with the overall look. When I look at the picture I get the notion that 95% of the black can be removed without too much trouble. If you want to go all out, you will lose material thickness a bit, but it should be possible to make it look like new-ish.The decision as to how far to go is yours. May I suggest you take some pictures during the process to show others what is done and how things work out? This might help people with similar problems. I also found the below extremely funny and salient especially when looking at the WKC factory finish on my rather minty Argentine 1898 degen. The Pro-patina folks moan about the “scratched” finish we leave behind when the factory finish was often far worse ha! There will always be some faint scratching remaining. That is no big deal as the original polish was not any better as far as I can see......... Work all around the scabbard and drag and never mind the scratches. 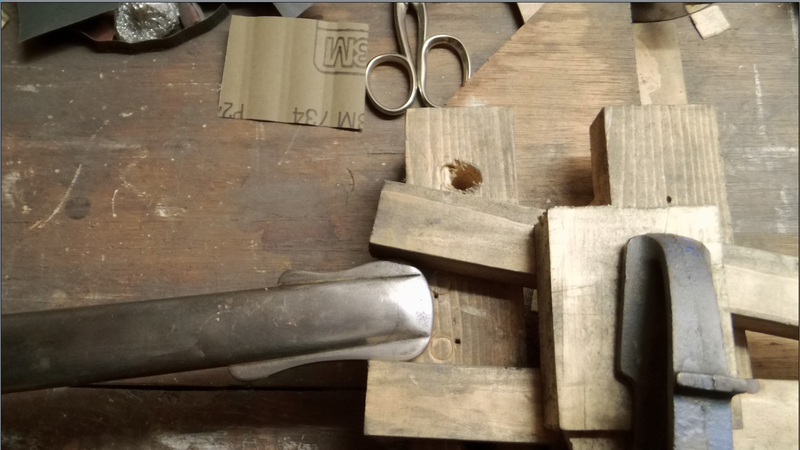 The drag will have lots of left over scars from the factory and use anyway and if viewed from the side, the scabbard at this point will display lengthwise scratches left over from the fact that the original polisher did not get in there going over the width. Nobody cared anyway.